Venice Apt. 100 yds from beach with parking included. Modern apartment with enclosed terrace just 300ft (100m) back from broad sandy swimming beach and Pacific Ocean. Modern style furnishings with hardwood and marble floors throughout. This 1 bedroom apartment is located on a quiet residential pedestrian street and is a 2 min walk from Venice Pier and Washington Blvd’s trendy cafes/restaurants and historic Venice canal district and 5 min walk to world-famous Muscle Beach and the entertainment of Venice Boardwalk; now the 2nd most popular tourist destination in California. Drive time: 5 mins to Santa Monica, 10 mins to LAX airport, 30 mins to Hollywood, Getty Museum, Queen Mary or Malibu. 45 mins to Disney theme parks. 2hrs to San Diego, Santa Barbara, Palm Springs or Big Bear Ski areas. Ideal base for Southern California tour or relaxing beach vacation. Small dogs OK with permission, smoking permitted outside only. 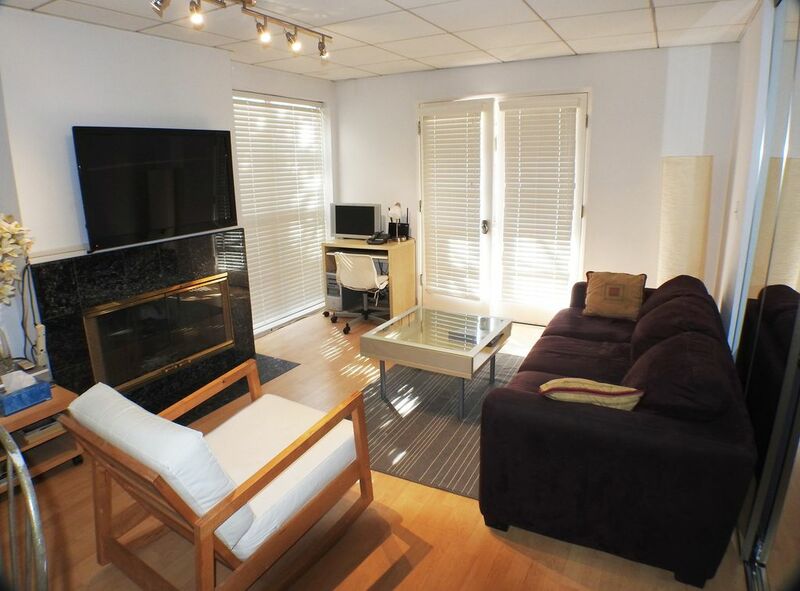 Ask about our 2Br unit with spectacular roof deck upstairs in this building. Steps to the beach with cool breezes yet close to all the Los Angeles activities. There are very few hotels in Venice and only the Erwin as close to the beach as this apartment. The apartment solves the car parking issue that is a problem at so many other beach rentals. Availability not guaranteed. Suitability not guaranteed. Amenities include, queen size bed with linens provided, queen size sofa bed in living room with extra linens provided, fully equipped gourmet kitchen with granite counters, pots, dishes, utensils provided, full size gas stove, full size refrigerator with ice maker, built-in microwave, marble tile bathroom, towels provided, Jacuzzi tub, full size washer and dryer (in unit), satellite 42" HDTV over 600 channel DIRECTV incl HBO and SHOWTIME, gas central heating and gas fireplace, air conditioning, two standard size parking spaces (no RVs or oversize vehicles), 100MB internet wired and/or wireless connection, direct inward/outward private line phone with free telephone calls to US and Canada, travel guides, maps, paperbacks and DVDs, large enclosed patio with BBQ grill. Gerald’s place is cute and comfortable, on a lovely street, and steps from the beach. It was a tight squeeze for four people, but we made it work. We enjoyed our stay in Venice beach. The owner was great to check in on us to make sure our arrival went smoothly. The property was quiet and had some little extras that we’d forgotten. The information in the binder was also helpful. Right in the heart of Venice. Easy walk to everything. Place is quite small and not really outfitted for 4. Location to beach is wonderful! The property provided very easy access to the beach. It is near the hub of activity and we enjoyed the restaurants and the many vendors along the strip. The apartment could use a little attention and I have shared my suggestions with the owner directly. Were these to be implemented, I would give it a higher rating. My wife and I really enjoyed our stay in Venice at 32 28th Place. The apartment is very nice and really close to the beach. We used the patio a lot to eat our meals and to relax after a day of sightseeing. We used the bikes to ride the trail on the beach. We will definitely stay here again. It will be a delight to have you back too. You were very nice guests and left the apartment in great shape. I am so happy that you enjoyed your visit. Adorable, steps from the beach & restaurants. This apartment has everything you need for a relaxing beach vacation. You will be on a quiet pedestrian street in a great part of Venice, yet in just a few minutes you can walk to Muscle Beach and see all the bohemian glory of Venice Beach. Walk two minutes inland and enjoy the serenity of the Venice Canals. Free parking for two standard cars - a rare commodity in this area! When you are relaxed out, a 30 minute drive will take you to Hollywood and all of the hottest clubs in the country. A farmers market is held every Saturday morning nearby, great for spotting celebrity Venice residents and getting great food. Reservations are not considered complete and are subject to prior booking until your deposit arrives and you have received a confirmation e mail from us. Deposits can be applied to different rental dates if your plans change. Stays of 30 days or more are not taxed, contact us for special lower price.